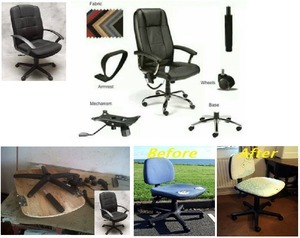 The Office Chair Repairers - we repair your office chair. AND we now give you a 2 (two) year warranty on repairs! And you get that priceless 2 year warranty for free! Also do not forget about the loyalty program, where you get points leading up to discounts for 1) repairs you do at the Office Chair Repairers (1 point/R100) and 2) succesful referrals to us, which will earn you 2 points. Full detail on our Facebook page and on the website! Feel free to let us know what you think of the idea? Bring your chair, let us repair it. Whether it is the gas cylinder (sinks down), the castors or base, even arms and seats! If the seat is unstable, it could be the mechanism. Love your chair but the foam is gone and you sit on the bolts? We replace your foam and/or reupholster your chair! What have you got to loose? Call us and ask: Elmien is waiting for you with her cell in her hand! 083 390 1938. Then give us a try! And don't forget about that 2 year warranty! You won't regret it. You will if you don't repair your chair through The Office Chair Repairers in Lyndhurst, Johannesburg. Remember - 083 390 1938!